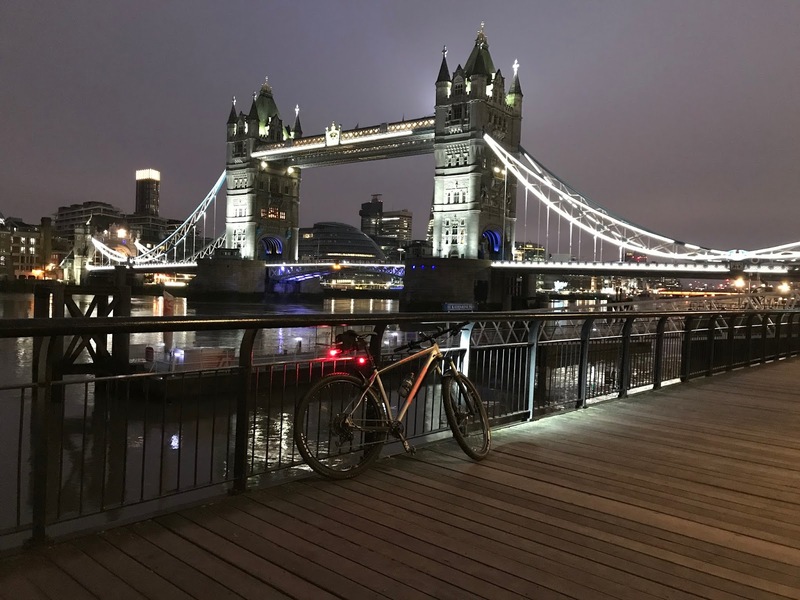 Last year I completed the Rapha Festive 500 for the first time CLICK HERE and with some time off work in the run up to the new year I decided to have another bash. For those of you who don't know what the Festive 500 is, it is a challenge to ride a total of 500 km / 310 miles in the eight days between Christmas Eve and New Year's Eve. First laid down in 2010 by the cycle clothing manufacturer Rapha, it has proved to be very popular with cyclists all across the world. Family is very important to me and the conditions for me participating in this event was clear. It had to have no impact on them whatsoever. In other words if Mrs Orange and the Orangettes wanted to go shopping, for a walk, visit other family members, veg on the sofa etc.., I had to be around to do all of these things too. This meant that virtually all of my rides would have be to completed at a time when they were either still asleep and/or finishing when they were just getting up. Added to this, all of the rides would have to be in London wherever possible (as it would make getting back home easier if I needed to). Being an early riser by nature, getting up before the dawn chorus was not too much of a chore. To speed things up I didn't even shower. I just brushed my teeth, had a bite to eat, put my cycling gear on and headed out. 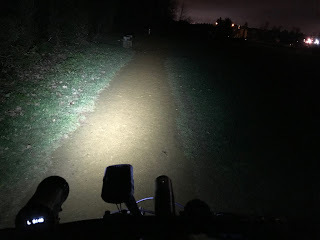 Last year the first few rides acted as a bit of a therapeutic exercise as much as taking part in a challenge (see the blog post to find out what I am going on about if you wish). I mention this as Day #1 proved to an accidental cycle down memory lane in more ways that one! I have to report that at the end of this first day I was ready to throw in the towel. 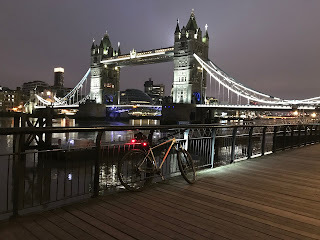 I decided to take my Whyte 629 mountain bike as my plan was to get on the Grand Union Canal in West London, cycle to Paddington, where I would exit the canal path before heading into Central London and then along the Thames Path to the Thames Flood Barrier. Once there I would cycle all the way back again. I knew the route reasonably well but some locations looked completely different to me in the dark and subsequently I did make the odd wrong turn. I mentioned that the route would serve as a cycle down memory lane as I knew that I would pass Kensal Green Cemetery where the funeral service for both my parents took place. I had not however bargained to pass the house my parents lived in when they first got married, the hospital were they both passed away and cycling in the park I used to get up to all sorts of mischief in when I was a great deal younger. 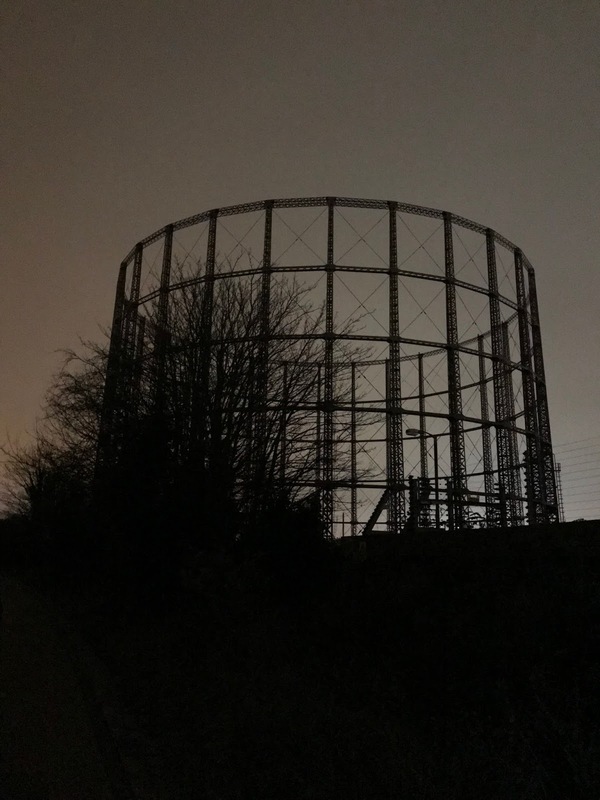 As I exited the park in question in the quiet of the early pre-dawn morning, I was almost convinced that I could hear my dad's wheezing laugh and my mum saying in pretend incredulity 'seriously?' at the thought of me cycling at stupid o'clock. I have mentioned before in blog posts that I don't really like cycling along bodies of water too much - especially canals. 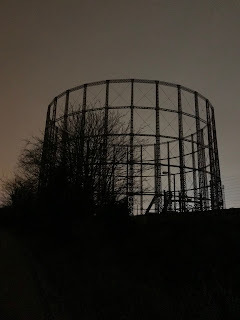 I took my meaty exposure light which almost turned night into day but I found the whole experience mildly terrifying. 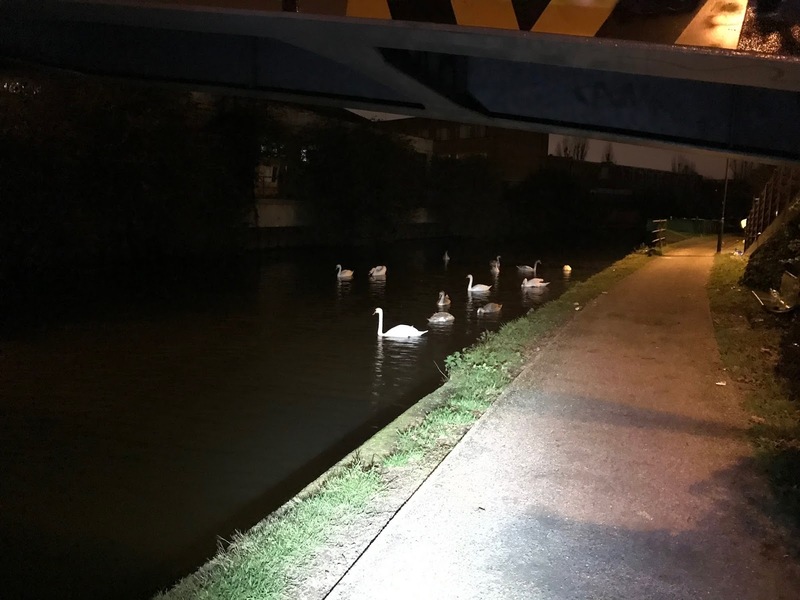 Along the canal path all manner of wildlife could be seen. Rats, mice, bats, Swan, Canada Geese, cats and even a badger - think? In addition to the sight the sound of owls hooting and the scurrying of unknown creatures added to the general foreboding atmosphere. Despite there being only four photos posted here believe me I took a great deal more. I even put a few on Instagram and shot a little bit of video. If I had of taken one of my big cameras I would have taken even more. When it dawned on me that this was not the best use of my time, I resisted the urge to take a photo of anything that moved or stayed still!! The streets were totally empty and even along the Thames Path I only saw one other person jogging with their dog all the way up to the Thames Barrier. Reaching the Barrier I was all but ready to take even more photos but knew I had to cycle back. I had done just over 36 miles. By the time I reached the cycle highway on Embankment I decided that mountain bike tyres and gearing - on tarmac - were a great deal slower than my Brompton or road bike. At about the 48 mile mark I hit in running terms the wall, or in cycling terms, bonked. I could barely turn the pedals and got slower and slower. I was also wobbling and weaving about which was not the best for cycling along a narrow canal path! Having eaten the last of my food and knowing that nowhere was open, I didn't really know what to do but stop. Looking in my saddle bag in desperation more than anything else I managed to find a Mars Bar and gel that I must have packed for the overnight ride to Brighton I participated in back in October but didn't use! After a few minutes I felt fine again and continued. Reaching home before Mrs Orange and the Orangettes had woken up I had a shower and retired to my bed for 40 winks before later getting up and carrying on as normal. Thankfully, we were eating at a relatives house later in the day and believe me I made up the calories I lost. Christmas Day was wonderful. After opening the presents at an ungodly hour - despite the Orangettes being teenagers - they retired to their beds with their respective haul. I popped out for a quick 10 miles which basically meant me doing circuits around my local area which is quiet and not too hilly. This I completed on my Condor road bike. When we got home from visiting family and everyone had gone to bed I competed another 10 miles. For day 3 and 4 we were based not too far from South Kensington. Knowing this the Brompton was brought out and my target area was simply Hyde Park itself. I had thought about going out to the Barrier and back again but I knew this would take a great deal longer so I opted for laps of my beloved Hyde Park. At just under 5 miles managed 10 laps on day 3 and 10 and a bit on day 4. I have to report that this was my favourite route bar none and if I do the Festive 500 next year, I am going to start at midnight on of the days and see how far I have got by about 07:00. Some of the poor Police Officers on duty didn't really know what to make of a chap at speed on an orange Brompton and kitted out in lots more orange. I nodded as I went past them and by the third lap they waved back every time I cycled by. Day 4 was back on my Brompton well before dawn and cycling to my old haunt of Richmond Park. Normally the park opens at 07:30 but the pedestrian gates are open which...ahem...allows pedestrian access. I was rather worried about my path being blocked by or being chased by Red Deer (Fenton) but there was something much more terrifying in the park I can tell you. Having completed three circuits all was going well. My Exposure front light did a wonderful job of illuminating the path ahead and in front of me I thought I saw an apparition. I was terrified! The being in front of me seemed to be walking but floating? Not really wanting to turn round the other way - in case I caught sight of it face on when completing another circuit - I pressed on. As I got nearer I build myself up to say, 'speak spirt...I am not afraid' but to my relief I saw that the ghostly form was in fact someone on a par of dry skies. As I passed by I nonchalantly said, 'morning...lovely day for it.' I didn't see them again after this but I was amazed at how fast they could go. Day 5 saw us back near South Kensington having stayed overnight. Early morning circuits of Hyde Park were the order of the day back on the Condor. Despite loving the route the weather was terrible. It was freezing cold, windy and raining. Even though I wore lots of layers and had good waterproofs I could not get warm and felt cold for the entire time I was out. I was very pleased to get back inside however my plan to cycle a little further was abandoned. Yesterday I had calculated that I only needed to cycle 7 more miles and the Festive 500 would be mine. I simply took the Condor out and did circuits around where I live which didn't take me too long. I had done it...or had I?! Day #7 (31/01/17) 7 miles. Total 312 miles...phew!!! When doing the write up for this blog post earlier this morning I discovered that I was short by 7 miles. I couldn't believe it. I got the Brompton out and did a few circuits starting and finishing at my front door until I had done the required 7 miles. I had done it. If I had a go at this next year I really do think that my idea of picking suitable day and starting just before midnight and completing circuits of Hyde Park, moving on to Richmond Park if I got bored until about 07:00 might just work. To do this I would try and enlist a few friends as cycling solo has its plus points but can also be very dull too. In doing this I would build up a large tally of miles with a view of not having to be out every day. Next time I would use my Condor road bike as much as possible and where not my Brompton. 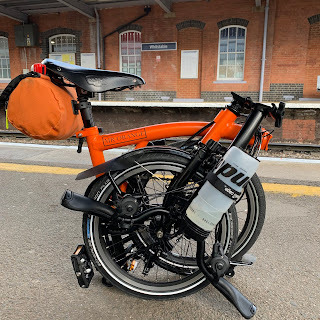 The Brompton is quite nippy on the road and incredibly comfortable. It also has the bonus of being able to fold up and put on a bus or train if I got fed up cycling. Despite enjoying it, the mountain bike would stay at home, unless conditions were terrible and I felt safer using it. No photos. I am terrible for this. The first ride on day 1 was ridiculous in many ways. London just looked so lovely it was hard to resist the urge to take lots of photos. When doing circuits of Hyde Park there was a group of soldiers on horses riding near Hyde Park Corner. No guesses who stopped to take photos and video. Strava. I don't do Strava but I suspect I am going to have to at some point. I think it would make logging the rides easier and I can perhaps see friends who might also be doing the challenge. Thank you to Rapha for putting this mad idea out there. This is not an easy challenge but if you have the time, it is worthwhile. Not too long from now some of you reading this we will be entering in to 2018. I wish you all a very happy and peaceful 2018 and hope that you get on your bicycles and have lots of adventures. Major acheivement that! Well done!